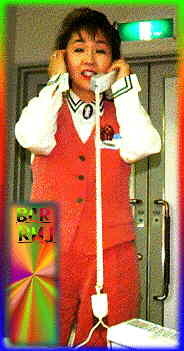 We had the first fans fest on 28 April, 1996 in Tokyo. Over 200 fans were gathered from all over the country. Sayuri Yamamoto (her nickname is Chappy) who is very famous journalist and DJ amongst all BCR fans in Japan presided over the event. And Mr. Miyata of BMG Victor. 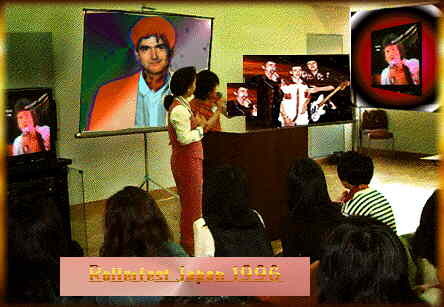 First of all we saw the documentary film titled "BCR Japan Tour '77 We Want Rollers" with a big screen about one hour. It's a rare film presented by the promoter who invited BCR in '76, '77 and '78. It's the Budokan live and you can see the Rollers off time and the fans as well. It all remembered us those days with lots of happy memories. And we all thanked the Rollers to give us those great and precious time in life. After this film, we showed very rare videos of Japanese, British, American, German TV shows, video clips, "Kit Kat" TV commercial, etc. etc. all the time during the event. Takaaki Ichimura had a presentation and he talked about his study about the Rollers musical sound. There are several different versions in the song like Give A Little Love, Be My Baby, Summerlove Sensation, La Belle Jeane, Disco Kid, Bye Bye Baby, Yesterday's Hero, Dedication etc. Some of them are very little difference, and we all were very impressed by his presentation. We had asked all the participants to bring at least one treasure, something which has a memory of the Rollers, and we asked to show us those precious treasures. There were some pictures, rare bootleg records, magazines, a watch with Roller picture, etc. We also had an exhibition corner with all Japan Tour programs, concert tickets, special magazines, Roller Gear, posters, and history of BCR panel, etc. etc. We didn't announce to the participants in advance, but we prepared a special event at the end of the show. It's a long distance call from Les to the fans at the show! Although we had unexpected trouble to connect Les's voice on speakers for the first a few minutes., when Les's voice and came out to the speakers, we all were very very happy to hear Les's lovely voice! Lucky four fans were chosen to speak to Les on phone and ask him questions. They were all very excited, their heart were beating and voices were trembling. We were all very happy to hear what Les has been doing, and his daily life, about his son Jube, and possibility of Japan Tour, etc. etc. and it was also nice to hear his wife Peko's cheerful voice too. Les sounded very happy too to speak to all of us in Japan. It was really a fantastic finale. All in all it was a great success and we hope to have 2nd fans fest again later this year, but now Les is coming for Japan Tour with his Legendary Bay City Rollers early next year. We are going to have 2nd fest with Les and the band on the 10 February at Nagoya Bottom Line. A concert and party Les has been loved by so many fans here in Japan and he deserves it. Thanks to Akemi for this Review !